On Saturday, Ralph and I will be attending our grandson Patrick’s graduation from ROTC leadership training at Fort Dix, New Jersey. He did this two years ago and was selected again this year. We’re pretty proud of him! Because of that, I won’t be able to go to my regular Weight Watchers meeting. 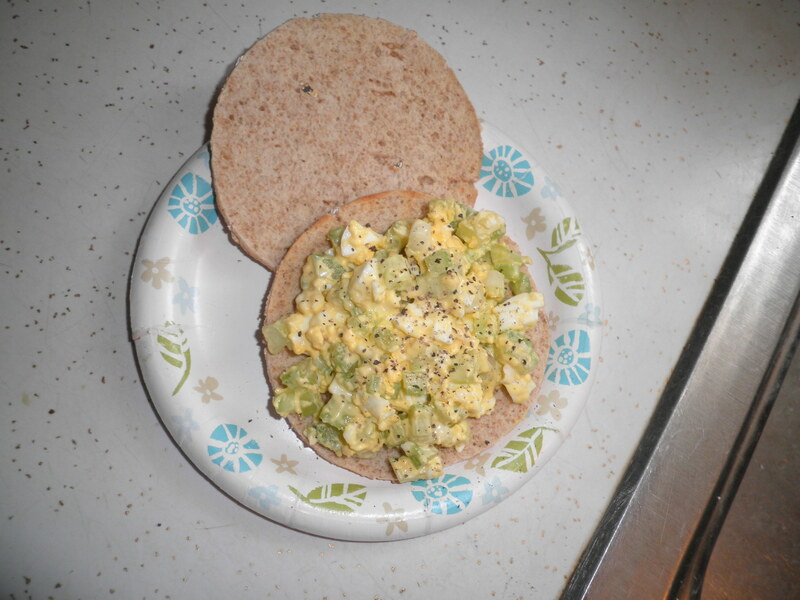 I had a wonderful home-made egg salad sandwich for lunch on Thursday. Not very colorful, but very tasty on a toasted sandwich thin. Tried something a little different for dinner. Sautéed up an onion and garlic, then added the rainbow salad I had gotten at the produce market last weekend. The blend was carrots, red cabbage, cauliflower and broccoli. Added a chopped tomato, veggie broth, crock pot black-eyed peas, some various spices (need to remember to write these down!) I served it over bulgur. I love making bulgur. This time I boiled the water (2 cups) in the microwave and then just added the bulgur (1 cup) to it. So easy! I let it sit in the warm microwave until it was all plumped up and perfect. It was delicious and filling and you KNOW those are 2 of my favorite things! 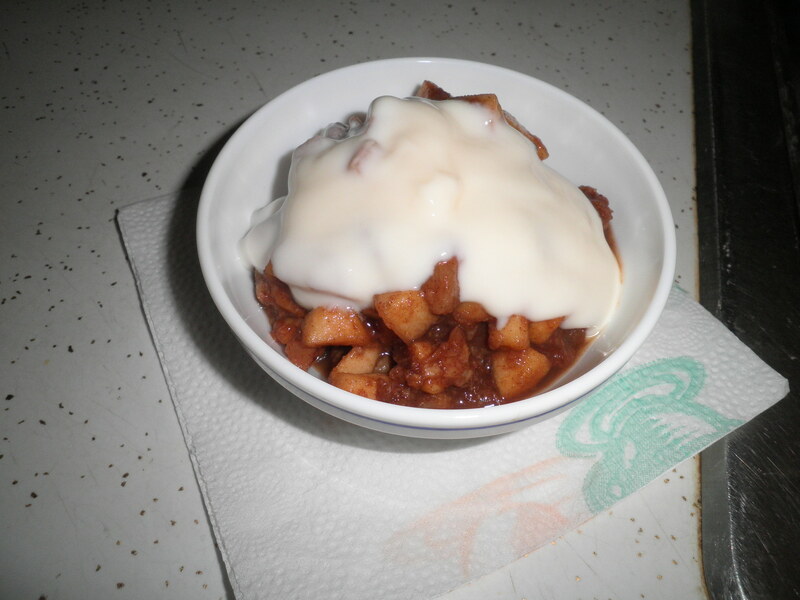 For a snack later, I finally remembered I had cooked up pears and apples in the crock pot earlier in the week. Topped with fat-free vanilla yogurt…absolutely delicous! Happy Saturday! Pray I don’t succumb to sun stroke!! This entry was posted in Uncategorized and tagged crock pot, Weight Watchers. Bookmark the permalink. enjoy your celebration with patrick today, fran! yes, do what you can to beat the heat – wear something loose and take water with you (copy my ice bath method when you get home?!!). that is a super easy way to cook bulgur – i am going to remember that. and what is this – you did not use the bpb for the salad?!! That wasn’t a salad, Cathy…that was cooked! Stayed nice and fresh looking though, so that’s a good thing. This is what I used to use for salads before BPB. I used to make a terrible mess, more salad in my lap than in the plate! BPB is such a plus. Trying to decide if I want him to go on the road trip with me. I don’t think I have anything in NM that’s big enough! Have a great time! I hope the forecast is wrong—100-plus degrees is just too hot. I think your Southern-lady plan is a great idea. 🙂 Happy Saturday! Thanks, Dana! We’re hoping for the best! Nice looking dinner! 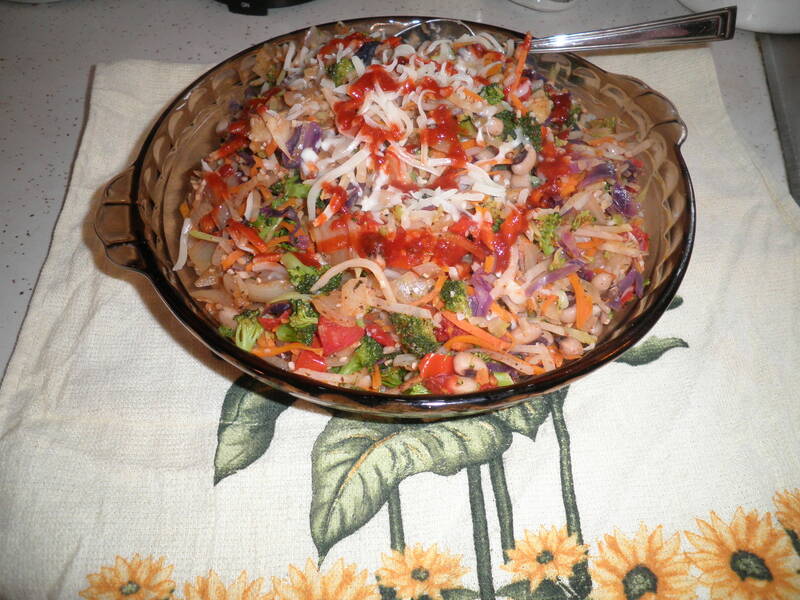 I love doing those sort of bakes with my broccoli slaw. Thanks, Laura! 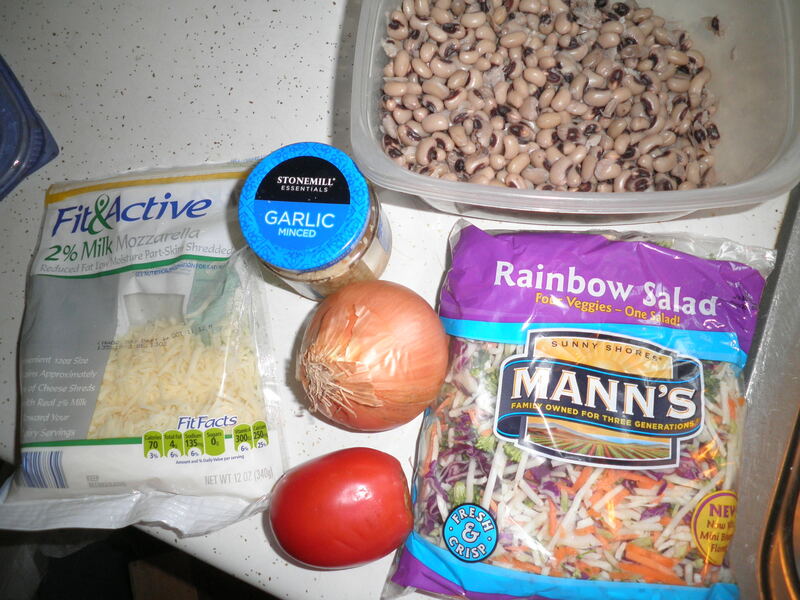 I can’t find the slaw mix very often. I was happy when I did. Have a great weekend! Turns out we didn’t go, Val. Long story…tomorrow’s post. Oh yeah…it’s a hot one today! Hope everything goes well! Terribly hot…I can’t take it! Have a fun day and I hope you don’t melt Fran! I have been watching the weather from gorgeous CA and dreading the re-entry next week! Stacie, maybe things will be a little more pleasant once you get back to NJ. Bring some of that CA weather with you. Glad you’re enjoying yourselves! !